Is the International Community Unfairly Biased Against Israel? There are numerous reasons why it is appropriate for the international community to focus so heavily on Israel’s crimes against the Palestinians. The latest installment in United Nations bashing occurred this past week when all 100 United States Senators——including such progressive figures as Bernie Sanders and Elizabeth Warren——signed a letter accusing the organization of using its platform “to advance an anti-Israel agenda” and “at times” to “reinforce the broader scourge of anti-Semitism”. The allegation is not a new one, and has long been a favorite of US officials attempting to obfuscate Israel’s appalling human rights record. The simple truth is that for as long as Israel has been a member of this institution, Israel has been treated differently from other nations at the United Nations. And not only in decades past——such as in the infamous resolution that the General Assembly adopted in 1975, with the support of the majority of Member States, officially determining that, “Zionism is a form of racism”——but also in 2016, this year. One need only look at the 18 resolutions against Israel adopted during the UN General Assembly in September; or the 12 Israel-specific resolutions adopted this year in the Human Rights Council——more than those focused on Syria, North Korea, Iran, and South Sudan put together——to see that in 2016 Israel continues to be treated differently from other Member States. Power’s argument bears a measure of superficial validity. It is undeniable that since 1967 there has been disproportionate focus on Israeli crimes in some bodies of the United Nations, particularly in the UN Human Rights Council which has passed more resolutions condemning Israel than it has any other country——a discrepancy criticized by both UN Secretary General Ban Ki Moon and his predecessor, Kofi Annan. Indeed, while there are several countries with human rights records more egregious than Israel’s, Israeli crimes often remain the center of international attention. Regardless of the validity of the charge of unfair concentration on Israel it ought to be recognized that accusations of ‘disproportionate focus’ or of being ‘singled out’ have long constituted a final line of defense for egregious human rights violators. The arguments presented by Samantha Power particularly echo those once propounded by apologists for apartheid South Africa. There are endless lists of human rights violations—mounting atrocities of black against black. Political prisoners are tortured in Zimbabwe. There are 200,000 to 300,000 people behind barbed wire in Mozambique. Escaped SWAPO [South West Africa People’s Organization] detainees tell of torture—in some cases until death. The list goes on and on, and yet it never seems to get the attention of the media or the anti-apartheid campaigns. Just as Power’s accusations of differential treatment and double standards bear some form of superficial validity in relation to Israel, so too did Kriek’s accusations of inordinate condemnation bear some validity in relation to Afrikaner-dominated South Africa. Yet no human-rights oriented individual today would argue that the international opposition to apartheid in South Africa was unjustified. The human rights violations of the white Afrikaner government were egregious and shocking enough on their own to transcend any comparative framework. Apartheid is, after all, one of the only two international crimes, the perpetration of which States are duty-bound to prevent. Many supporters of Israel will, of course, assert that to accuse Israel of apartheid, or to draw a comparison between Israel and South Africa, itself amounts to an anti-Semitic slander. However, indignation over such a comparison is belied by the ever-lengthening index of human rights reports and political figures who have found such a comparison to be valid. Most recently, a comprehensive United Nations Economic and Social Commission of Western Asia (ESCWA) report co-authored by the international law professor Richard Falk and the political science professor Virginia Tilley found——working within the framework of the 1973 Convention on the Suppression and Punishment of the Crime of Apartheid——that Israeli policies towards the Palestinians clearly met the legal definition of apartheid. Moreover, the journalist Mehdi Hasan pointed out in the wake of Israeli backlash to the ESCWA report that numerous high level Israeli’s—most of them far from sympathetic to the Palestinian cause—have warned that “apartheid is not a future risk but a present reality” in the occupied territories. Other reputable figures—from former U.S President Jimmy Carter to esteemed South African lawyer John Dugard to South African Archbishop and Nobel laureate Desmond Tutu—have argued that Israel’s system of control and segregation in the Occupied Territories constitutes apartheid. The United Nations focuses disproportionately on the Israel-Palestine conflict in part because it has historically played a disproportionate role in the origination and perpetuation of the conflict. In 1947, in response to Britain’s request to turn over responsibility for the Palestinian mandate, the United Nations General Assembly passed UN resolution 106, which established the United Nations Special Committee on Palestine and assigned it the responsibility of submitting “such proposals as it may consider appropriate for the solution of the Problem of Palestine”. The United Nations’ proposed solution of territorial partition—embodied in UN General Assembly Resolution 181—manifestly failed to resolve the conflict between Arabs and Jews in Palestine and was not implemented. The Partition Plan was nevertheless seized upon by the Zionist leadership as a “birth certificate” for Israel, which unilaterally declared independence on May 14, 1948. In both passing the Partition resolution (correctly regarded by Palestinians as highly prejudicial towards their national right to self-determination) and failing to enforce it, the United Nations bears a level of responsibility for spawning the plight of the Palestinians that it does not bear in relation to any other enduring international conflict. As Richard Falk and Virginia Tilley wrote in an open letter to US Ambassador Nikki Haley, “denying that the UN has a special role here ignores the unique responsibility of the UN in relation to this conflict”. Prior to 1967, the United Nations demonstrated unprecedented lenience towards Israeli breaches of international law. The 1948 war ended with the drawing of armistice lines, and Israel is thus the only country in history to have attained membership of the United Nations while failing to specify its legal borders. At the United Nations the Arab states cogently argued that admitting Israel would constitute “condoning, by a solemn act of the United Nations, the right of conquest”. They furthermore argued that Israel’s forcible expulsion of some 750,000 Palestinians, compounded by its refusal to allow these refugees to return, rendered it unable to meet the United Nations’ criterion for membership, namely that applicants demonstrate themselves to be “peace-loving”. As such, while Article 2 of the United Nations Charter unconditionally bars the acquisition of territory by war and the United Nations Partition Plan had allotted no more than 56% of historic Palestine to a Jewish state, in accepting Israel as a member the United Nations effectively recognized Israel in 78% of historic Palestine and legitimated Israel’s egregious violation of international law. Having already been granted one free pass, Israel’s further territorial acquisitions post-1967 constitute a consummate middle finger to the authority of international law and the United Nations. It was only then that the deluge of United Nations resolutions against Israel began. Israel attracts asymmetric international criticism because the legal contours of its conflict with the Palestinians are so conspicuously clear-cut. Many internationalized conflicts—Syria, Iraq—are convoluted to the point that it is difficult to imagine a politically realizable resolution in the short to medium term. By contrast, for decades the international community has been virtually unanimous in its understanding that the Israel-Palestine conflict ought to be resolved within the legal parameters of a two-state settlement along the June 4, 1967 borders, with the establishment of a viable Palestinian state in the West Bank, Gaza and East Jerusalem. Immediately following the 1967 war, the Security Council passed Resolution 242 which, recalling “the inadmissibility of the acquisition of territory by war” as first articulated in Article 2 of the United Nations Charter, called for Israeli withdrawal “from territories occupied” in the 1967 War and a “just settlement of the refugee problem”. That understanding has been reinforced by the annual and overwhelming adoption of the “Peaceful settlement of the Palestine Question”resolution by member states at the General Assembly in addition to a near-unanimous (14 votes to 1) 2004 International Court of Justice decision. The two-state settlement has been endorsed by all of Israel’s Arab neighbors since the 2002 Arab Peace Initiative, including Hamas, which has repeatedly signaled its intention to negotiate a settlement along the internationally recognized borders. By contrast, in continuing to demand Israel’s ‘right’ to unilaterally annex East Jerusalem and various settlement blocs, Israel and the United States remain virtually alone in opposing it. Israel is subjected to a barrage of critical resolutions from various United Nations organs and agencies in substantial part because it is shielded from criticism at the only United Nations body capable of authorizing real action to end Israel’s human rights abuses—the Security Council. While the Security Council has authorized sanctions against a number of states in response to their refusal to terminate a belligerent occupation—most memorably, Iraq, after its 1990 invasion of Kuwait—the United States’ veto power over resolutions tabled by the Council has crippled the organ’s ability to hold Israel accountable for its crimes. In 2016, for example, the UN Security Council passed eleven resolutions concerning human rights abuses in Sudan and South Sudan, six concerning Syria, five concerning Libya, five concerning Somalia and a multiplicity of other resolutions concerning various conflicts across the globe. It passed only one resolution, however, concerning Israel and the Occupied Palestinian Territories. Not only was Security Council Resolution 2334’s criticism of Israel restricted to a toothless condemnation of the expansion of settlements and a vague call for all parties to refrain from “acts of violence against civilians”, but it was also the first resolution passed against Israel in eight years. In the same speech condemning UN ‘bias’ against Israel, Samantha Power bragged that “since 1967, the only president who had not had at least one Israeli-Palestinian-related Security Council resolution pass during his tenure is Barack Obama”. Israel is already singled out for exceptional treatment—from the United States. In addition to vetoing UN Security Council resolutions critical of Israel, the Obama administration signed a 38 billion dollar aid deal to Israel—the largest aid deal in human history. Needless to say, one searches in vain for any U.S Senator’s outraged condemnation of the United States’ disproportionate focus on Israel, and its “singling out” of the ‘Jewish State’ for preferential treatment. For the Arab population across the Middle East, Israel’s occupation of Palestine represents a flagrant residue of European settler-colonialism and subjugation of indigenous peoples in a region with a long and bitter history of imperialism. For reasons not altogether apparent, foreign occupation and the denial of an indigenous people the right to self-determination have almost always engendered greater popular outrage and regional opposition than have the crimes of homegrown authoritarians and dictators. The Palestine struggle deeply resonates across the societies of the Middle East and Israel’s implementation of apartheid in the occupied territories is widely regarded as a bigoted affront directed at all Arabs living in the broader region. As such, just as the ‘singling out’ of South Africa was initiated and sustained for decades by the African continent, so too have the attempts at isolating Israel originated in the Arab-Muslim world. That Arab states have sought to castigate Israel via the United Nations, while the African states opted to utilize other means to turn South Africa into an international pariah, is a distinction without a substantive difference. Unlike the vast majority of other human rights abusers in its region, Israel, like South Africa before it, claims and flaunts democratic credentials. While South Africa saw itself as a democratic bastion holding out against a sea of black dictatorships, the Israeli government repeats ad nauseum its claim to be “the only democracy in the Middle East” (with the “most moral army in the world”) while simultaneously denying millions of Palestinians their basic civil and human rights. If Israel claims for itself a higher moral standard, is it so absurd for the international community to hold it to that standard? The Palestine region remains one of manifest historical and theological importance to broad swathes of adherents to all three major monotheistic religions. For Jews, Palestine is the ‘Promised Land’ of the Old Testament. For Christians, it is the birthplace of Christ and the historical setting of the Biblical narrative. For Muslims, Jerusalem is the third holiest city in Islam. Is it not then unsurprising that mass human rights violations in a region revered by billions produces disproportionate international incensement and condemnation? The response by the international community to the Israel-Palestine conflict appears one-sided because the conflict itself is so one-sided. Beyond the obfuscating discourse of Palestinian “terrorism” is the reality that the conflict’s violence has been overwhelmingly inflicted upon the Palestinian side. According to the estimates of even right-wing pro-Israel sources, almost four Arab/Palestinians have been killed for every one Israeli over the course of the conflict. At its core, the conflict remains one of a regional superpower, backed unilaterally by a global superpower, against a stateless, military-less people, the symbolic weapon of which is the stone. Few other conflicts evince such a radically clear-cut David versus Goliath image. Other international conflicts and military occupations might share one or even a few of the features here described. None, however, can claim to share them all. Disproportionate focus upon Israeli crimes at the United Nations may not be, in a strictly technical sense, “fair”. But if criticism of Israel really were the product of conscious bias or virulent anti-Semitism, wouldn’t ending the occupation and restoring the rights of the Palestinians be the most effective way of demonstrating such a reality? Wouldn’t those anti-Semites attempting to use the United Nation’s opposition to Israeli crimes as a cover for Jew-hatred be exposed as such? Self-proclaimed ‘supporters of Israel’ have pointed every which way in search of the source of Israel’s ever-worsening public relations debacle. It seems they’ve considered every possibility but the one staring them in the face: a 50 year old military occupation and the ongoing flagrant denial of Palestinian self-determination. When those end, so too will Israel’s status as an international pariah. Amir Tibon, “All 100 U.S. Senators Demand UN Take Action Against ‘anti-Israel Agenda,’” Haaretz, April 28, 2017. “U.S. Ambassador to the UN Samantha Power’s Full Speech at the Security Council,” Haaretz, December 24, 2016. May Bulman, “Ban Ki-moon says UN has ‘disproportionate’ focus on Israel,” The Independent, December 17, 2016 and Kofi Annan, “Kofi Annan’s Last Speech Last Speech on the Middle East to the Security Council”, The New York Review of Books, February 15, 2007. Anne-Marie Kriek, “South Africa Shouldn’t be Singled Out,” The Christian Science Monitor, October 12, 1989. United Nations Economic and Social Commission for Western Asia, Israeli Practices towards the Palestinian People and the Question of Apartheid, E/ESCWA/ECRI/2017/1, (2017). Mehdi Hasan, “Top Israelis Have Warned of Apartheid, so Why the Outrage at a UN Report?” The Intercept, March 22, 2017. Noam Chomsky, “On Israel-Palestine and BDS,” The Nation, June 29, 2015. UN General Assembly Resolution 106 (S-1), Special Committee on Palestine, A/RES/106 (S-1) (May 15, 1947). Richard Falk and Virginia Tilley, “Open Letter to UN Ambassador Nikki Haley on Our Report on Apartheid in Israel,” The Nation, April 25, 2017. These are the words of Charles Habib Malik, the representative of Lebanon at the General Assembly. Quoted in Jeremy R. Hammond.“The Role of the UN in creating the Israel-Palestine Conflict,” Foreign Policy Journal, August 26, 2013. For a comprehensive analysis of the United Nation’s decision to admit Israel as a member see Jeremy R. Hammond, Obstacle To Peace: The US Role in the Israeli-Palestinian Conflict. (Cross Village: Worldview Publications., 2016), 79-88. The United Nations Charter, Article IV. Accessible at http://www.un.org/en/charter-united-nations/. For an account of the Palestinian/Arab opposition to the United Nations Partition Plan see Walid Khalidi, “Revisiting the UNGA Partition Resolution,” Journal of Palestine Studies, Vol. XXVII, No 1. (Autumn 1997). United Nations Security Council, Resolution 242 (1967), S/RES/242(1967) (November 22,1967). In 2016 the General Assembly’s vote on the “Peaceful settlement of the Palestine Question” resolution passed by a margin of 155-7. “Traditional Voting Pattern Reflected in General Assembly’s Adoption of Drafts on Question of Palestine, Broader Middle East Issues,” United Nations, November 24, 2015. Legal Consequences of the Construction of a Wall in the Occupied Palestinian Territory, Advisory Opinion. (International Court of Justice July 9, 2004), 43 IL M 1009 (2004). “Arab Peace Initiative: full text,” The Guardian, March 28, 2002. Israel ignored the initiative, with then Prime Minister Ariel Sharon labelling it a “nonstarter”. In 2016, Israeli Prime Minister Benjamin Netanyahu again rejected the initiative–which is grounded in United Nations Resolution 242– as a basis for talks. Barak Ravid, “Netanyahu: Israel Will Never Accept Arab Peace Initiative as Basis for Talks With Palestinians,” Haaretz, June 13, 2016. For a survey of the history of Palestinian peace overtures and Israel’s intentional sabotaging of them, see Jamie Stern-Weiner, “Did Israel Just Thwart Another Palestinian Peace Offensive?” Jamie Stern-Weiner.Wordpress, March 19, 2017. 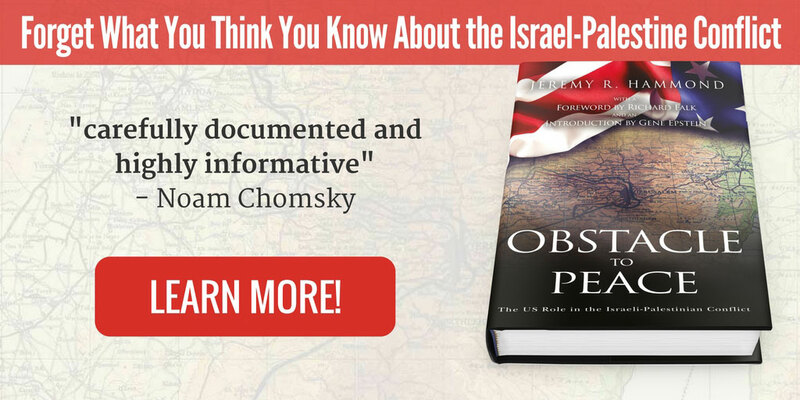 For comprehensive analysis of Israel’s attempts to legally justify its rejection of UN Resolution 242 see “Israel Versus the World”. In Norman G. Finkelstein, Knowing Too Much: Why the American Jewish Romance with Israel is Coming to an End (New York: OR Books, 2012). “Resolutions adopted by the Security Council in 2016,” United Nations, https://www.un.org/en/sc/documents/resolutions/2016.shtml. United Nations Security Council, Resolution 2334 (2016), S/RES/2334 (2016) (December 23, 2016). Peter Baker and And Julie Hirschfeld Davis, “U.S. Finalizes Deal to Give Israel $38 Billion in Military Aid,” The New York Times, September 13, 2016. According to the Jewish Virtual Library as of May 3, 2017, 24,969 Israelis have been killed over the duration of the conflict, while 91,950 Arab/Palestinians have been killed. Over the same duration 36,260 Israeli’s have been wounded while 78,038 Palestinians/Arabs have been wounded. “Vital Statistics: Total Casualties, Arab-Israeli Conflict,” Jewish Virtual Library.